This dress has a lined bodice and unlined, gathered skirt. The straps can be made from regular folded fabric, ribbon, or bias tape. Make sure if you are using ribbon that it is going to be sturdy enough to withstand some pulling (and washing). Strap length is going to vary according to size also, but I do suggest being generous, as you can always shorten, but lengthening will drive you mad. The loops shown above are made with 1/2" bias tape, though ribbon and regular fabric work well also. Strips about 3" long work well here. The skirt is gathered all the way around, but only stretches across the back portion. It's not easy trying to get a preschooler to sit still long enough to tie on a corset-like shape, so it's elasticized waist makes it quick to get into at the very least. 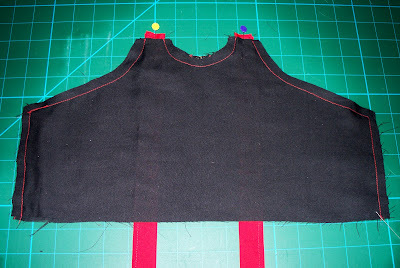 The bodice is fitted by using the waist measurement and subtracting a few inches (don't forget about seam allowances). The top shape can be found by either tracing an existing garment, altering a pattern to the correct shape, or winging it (as I did). 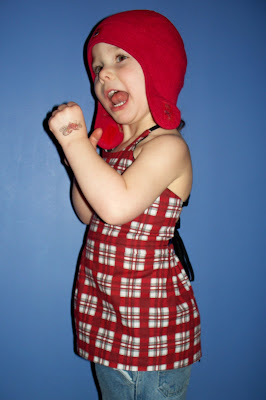 If you make your first cuts out of inexpensive fabric and then try it on the child before you sew, it's easy to make alterations until it fits just right. One part that you really want to pay attention to is making sure the shoulder area is just wide enough to fit the width of the strap you plan on using, plus your seam allowances. When you have the desired shape, cut 1 of main fabric and 1 of a lining fabric. Align these two pieces, right sides together, and pin in place. Don't sew yet! You want to secure your loops between the main and lining fabrics. Make sure you leave room on the top and bottom edges for your seam allowances and to do the waistline (about 3/4"). Reinforce the stitching over the loops. Stitch the sides, arm curve and neckline. Do not stitch the top portion where the straps attach. That is what you are going to do next. Stitch the straps in place. Open up the bodice and make sure that the straps are not puckered, folded, or angled strangely, then reinforce the stitching. Open bodice and press flat. Machine baste the bottom opening closed. The width of the skirt from above is a few inches shy of twice my child's waist measurement. Length is up to you, whatever you desire. Don't forget to add your hem allowance and another 1/2" or 5/8" or so for the waist seam. 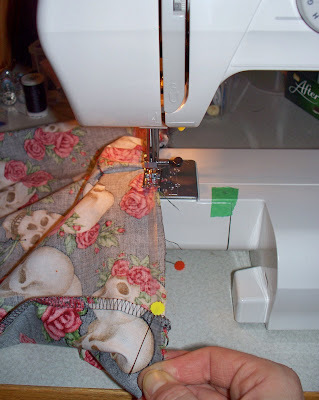 Sew the skirt into a tube. And the fun part: skirt gathering. No really, it is fun, because this dress uses clear elastic, which is so very friendly. You must use elastic (though you could get by with regular elastic, but I suggest no thicker than 1/2") because the back must stretch to actually get the child into the dress. Cut the clear elastic to the same size as the child's waist (or 1/2" longer if using regular elastic). Divide the elastic into 4 equal portions (use pins to indicate the 1/4, 1/2, and 3/4 marks and then the ends will overlap when you sew). Also partition the dress in 4 equal parts (sides, middle, back - again, use pins). These pins are to be matched up so that the elastic is evenly distributed when you sew. 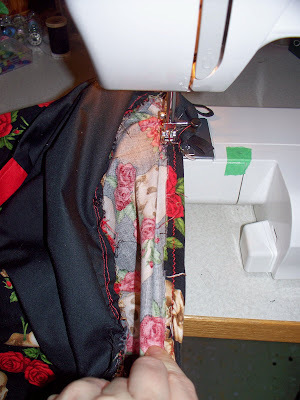 Start your sewing in your elastic flush with the raw edge of the top of the skirt at one of the pins in your bodice. Put a couple of stitches into secure elastic end and then stretch elastic so that the first pin meets the next pin on the garment. Stitch the elastic in all the way around the skirt, stretching the elastic to meet the next pin until it is all gathered. Pin the front midpoint of the bodice's bottom to what you want to be the middle front of the gathered skirt (right sides together). From this midpoint, work your way along the bodice on either side, pinning the bodice to the skirt without stretching the elastic. Sew bodice to skirt. To complete the waistline, you want to fold the edge of the skirt over, wrong sides together, to make a casing for the already stitched on elastic. It is really just a hem, but you have to stretch out the elastic as you sew. Use the part where the bodice seam ends as a guide to the fold over point and hem evenly along the back of the skirt. 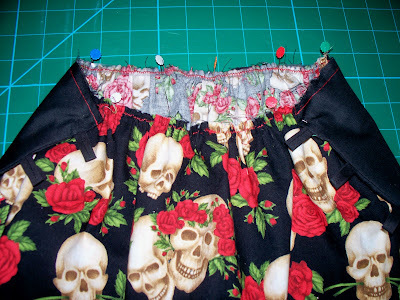 All that's left is to hem the skirt and add any embellishments you desire. Variation: to make a flat fronted dress or top (instead of a fully gathered skirt), cut two panels to form the skirt. One equal to half of the waist measurement and one 3/4 of or equal to the waist measurement. Sew these two panels into a tube. Use the clear elastic (measure to 1/2 of waist measurement) to gather just the longer panel, from side seam to side seam. 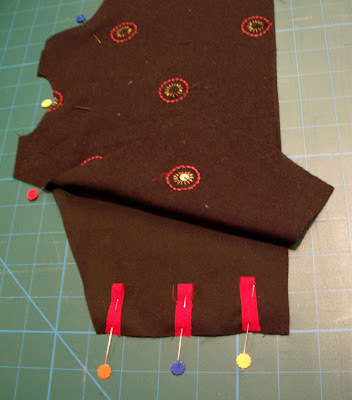 Find the midpoint of the ungathered panel and pin to the midpoint of the bodice. Proceed as above. Skulls and roses, my favorite! 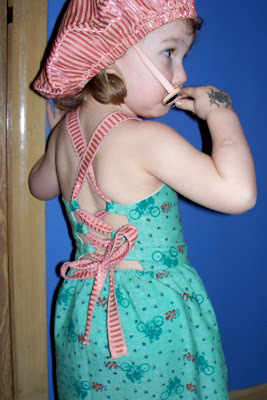 Not only is the dress the most adorable thing (I'm going to have to make several of those as tops for my daughter, as your last one shows), but your choice of fabrics rocks! Missed seeing your tutorials, glad to see you back- my feed reader was unhappy without you!! so cute! love the tute just wish I had a little girl to make it for. I LOVE this tute. 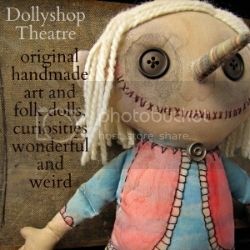 I just made one for my daughter and she looks so so cute!!!! Thankyou so much! Emma, I hope I get to see a pic! cute, cute, cute, cute, CUTE!!!!! 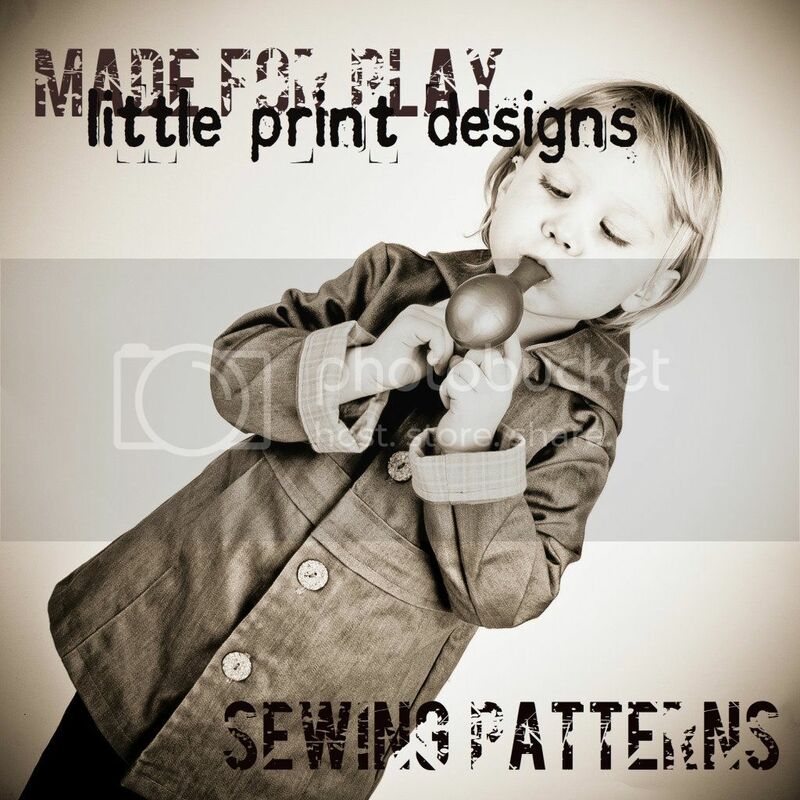 Can't wait to sew one for my 3 year old! Awesome! I just finished one for my 2 year old daughter and it is beautiful. I wish I knew how to post a photo in the comments so I could share it with you. 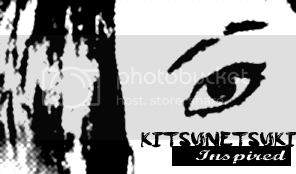 You can use a free photo hosting site like photobucket or flickr to upload your photo onto the internet, and then give us the link in a comment. I hope these direct links work. Love the fabric, anon! Thanks for sharing your photos of your adorable wee one. I'm glad the tute was helpful! LOVE this dress! I ran right out to the Joann's to buy fabric to make it for my DD...it's adorable on her!! Thank you so much!! I love the dress and the skull fabric! I wish I had a daughter... oh well, I'll have to make one for me! If this is your first go at sewing, CDukepoo, you've got an amazing start. It's perfect on your cutie - looks exactly how its supposed to. Okay, I know this tute has been up for a while, but I finally got up the gumption to start it...well, I've bought the fabric anyway. 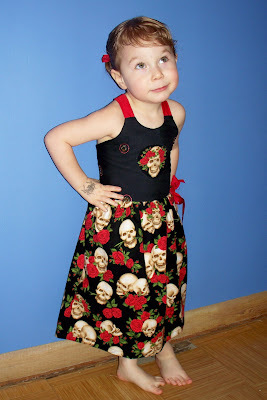 My niece is all about the punky-girly clothes and loved the skulls and roses one that you made. She is, however, a GIRLY girl and so I found a cute pink skull fabric with gray on black damask for the top. The damask coordinates really well with the swirly scrolly lines around the skulls. I am very excited about this project and will be starting it in a couple of weeks when school gets out. Hmm, I listed a comment this morning but it is gone! Sorry if it shows up later!! I just wantede to thank you for this tute :D I have made this 4 times now with the most recent being for flowergirls' dresses for my BIL's wedding next weekend. I love your work...the sleevy pants, the corset dress...sad thing is, I found your site whilst searching an easy pattern for a blouse for ME ...however, my grand-daughters are about to be thrilled with what I make for them....guess I will have to keep searching for that blouse for myself! i so appreciate all you do!! your tutes are great, your parenting wonderful, and your thoughts make me giggle and actually think :-) I have made several things, but never managed to get them up....my first attempt at the corset dress--was doing it away from the coputer, and couldn't remember what you had done for the straps--so we put in loops--it actually worked!! the fabric choices obviously leave a lot to be desired, but hazel picked them, and she loves her dress so it is a win/win!! thank you again for being so very you my dear!! i am seriously laughing at myself...not only did spell check let coputer through...but the link i posted is to an entirely different project (turns out kids like making t-shirts out of their drawings just as much as bags ;-) so thank you for that one as well!! maybe this is better?? <3 to you and yours!! 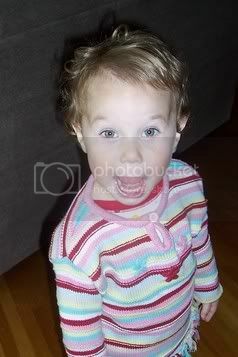 Amie, what a beautiful child! Your dresses look great, I love the skirt on the corset dress in particular. Thanks for all the kind words and thank you thank you for sharing your pics! I love this shirt and have made a few and posted on my blog. Thank you! I really enjoy reading such tutorials. How I wish I also have the talent to design some of those baby dresses. Great! I am currently getting out some boxes of fabric I've had stored for a while, to get some summer dresses made for my 4 YO granddaughter. I'm starting on the tiered twirl skirt, which is perfect, since much of my old fabric is woven prints in fairly small amounts and odd shapes. If she likes it as well as I think she will, I will make several. I am also planning a corset dress. I also wanted to comment on your model. She's amazing! I finally made it! Thank you very much for the idea and tutorial! Lovely dress. I have never thought that one can actually make their own corset dress like this. This looks so pretty. Definitely going to try it.